I visited Run of the Mill earlier in the month and will be doing a blog post about them soon. 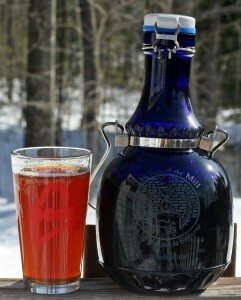 Before leaving I picked up one of their very unique growlers full of a Rye Ale. The growler looks very old with a large wooden handle and some very nice designs on the glass. The rye is a nice beer and I am sure they had a real name for it as they do with all their beer but I could not remember it and couldn’t find on their website either. Color is a deep orange with a almost no head. Nice sweet and slightly spicy aroma with a taste that follows suit. This was a very easy drinking beer and something I would recommend you try on your next visit to Run of the Mill in Saco.